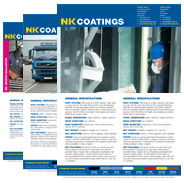 T-Wash » NK Coatings | The market-leader in metal finishing services in Ireland. T Wash is a treatment process for galvanized materials that speeds up the natural curing process of the zinc surface to allow the application of subsequent paint schemes. The mild chemical is applied by brush and etches into the surface of the newly galvanized surface turning it grey-black and neutralizing the zinc top layer. The treatment is ideal for when the product is too large for powder coating.